This is the story of a group of ordinary men who for individual reasons found themselves plucked out of their normal daily routines to become part of the British army of the Great War. Some were in the ‘poor bloody infantry’ upon whose backs the burden of the battles weighed heavily throughout the years from 1914 to 1918. Others played their parts in different ways, some behind the lines and some on the Home Front. Most of these ordinary men were on the Western Front, although two experienced the battle zone of the deserts of Mesopotamia. None were Officers, most were Privates, though one achieved the rank of Sergeant at the age of twenty. Most did their bit without any official recognition other than the Pip, Squeak and Wilfrid war medals at the end. One earned the Military Medal for conspicuous bravery under fire and his name is listed in the London Gazette. The whereabouts of his medal is a mystery. Most of the men returned to the ‘land fit for heroes’ and made what they could of their lives, keeping much of what they had seen, heard and experienced to themselves. Five never returned to their families. Four of those soldiers are remembered with headstones in the beautiful peaceful Commonwealth War Grave Commission cemeteries in France and Belgium: Heninel Communal Cemetery Extension, Bellicourt British Cemetery, Favreuil British Cemetery and Cement House Cemetery. One has no such grave but is remembered on the stone panels of the Arras Memorial to the Missing. All five are further remembered on the various War memorials of their English cities, towns and villages, including in the Cathedrals of Chelmsford, Carlisle and Ely. They are also recorded on databases and in websites listing those who fell in the Great War. Those who returned are listed in some Regimental databases or still have their army services records intact. For the most part they are known only to relatives as having been in that War to end all wars. I hope that those who have read my account of these men’s lives will have understood the deprivations and the sacrifices that many of them had to endure, the amazing distances covered around the battle zones by the infantry, and the difficult hospitalization of the ill and wounded. Some soldiers were lucky in their placements managing to avoid the front line action through medical conditions some of which may have even been self-inflicted. It may even be that some of these men were your relatives too and that I have been able to fill a gap in your family history. For me it has been a memorable journey of discovery through my previously unknown family history. I would not have been able to have done it without the material sources and the individual people who are acknowledged in the various chapters. I also hope that in reading this you may be spurred on to do your own researches into your relatives involvement in a war which, although is almost 100 years old, still captures our attention. As part of the Centenary commemorations of the beginning of WW1, an art installation ‘BLOOD SWEPT LANDS AND SEAS OF BLOOD’ was commissioned. 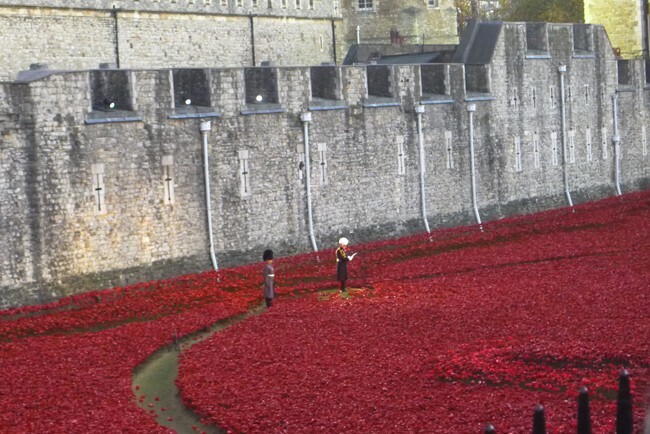 This work, created by Paul Cummins and Tom Piper, involved the planting of 888,246 ceramic red poppies in the moat of the Tower of London. Each poppy represented a British and Commonwealth fatality during WW1. Each poppy was purchased by a member of the public with the proceeds going to the Royal British Legion and five other charities that support injured service personnel. Between 11th August and 11th November 2014, the names of those killed in WW1, who had been nominated by the public, were read out nightly at sundown. This was watched by thousands and ended with the playing of the Last Post by a current member of the armed services. On 27th October 2014, amongst the 200 names read out by General Lord Dannatt, was that of Private F H Maltby of the Yorkshire Regiment. He was my Great Uncle, killed on 19th July 1917 and I was there to hear it. Frank Maltby’s name comes 11 minutes and 45 seconds into the reading by Lord Dannatt. It was a truly memorable and emotional experience for everyone who heard their relatives’ names read out. It recognized, in an incredibly powerful way, the sacrifices of all who have served and died in the conflicts since 1914/18.